A flash of inspiration for this week’s Sunday School game for the Good Shepherd from John 10:11-18. The shepherd stands outside the fold. The wolf (it) stands at the other end of the room. The shepherd & wolf turn their backs on the field area and the sheep (rest of the children) spread out between the wolf & the shepherd. When “Go” is called the wolf & shepherd can turn around and the wolf can begin chasing down the sheep. 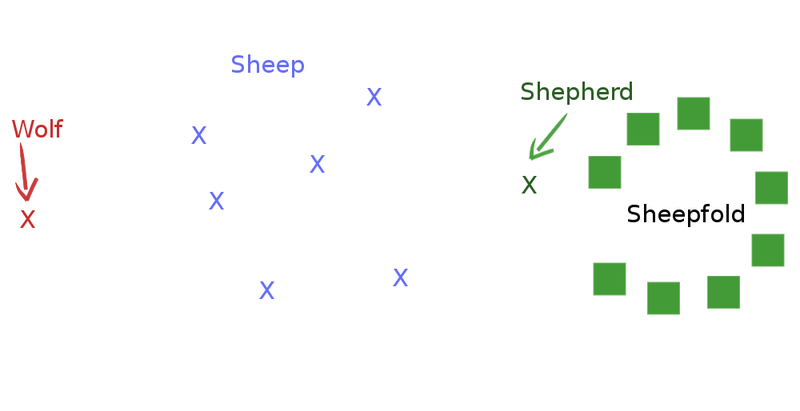 However the sheep are unable to move until the shepherd calls them by name, then they can run into the sheepfold.The shepherd can choose to lay down in front of the sheepfold as the gate at any time (preferably after all “live” sheep have made it inside) thus protecting the sheep inside from the wolf. Points could be allocated on the number of sheep saved by the shepherd. I have a long room free of obstacles to work with, but I may need to mark a field for the sheep, the timid ones will probably try to get as close to the shepherd as they can and the more boisterous may try taunting the wolf! Hello my long neglected blog!! Time for another dare. 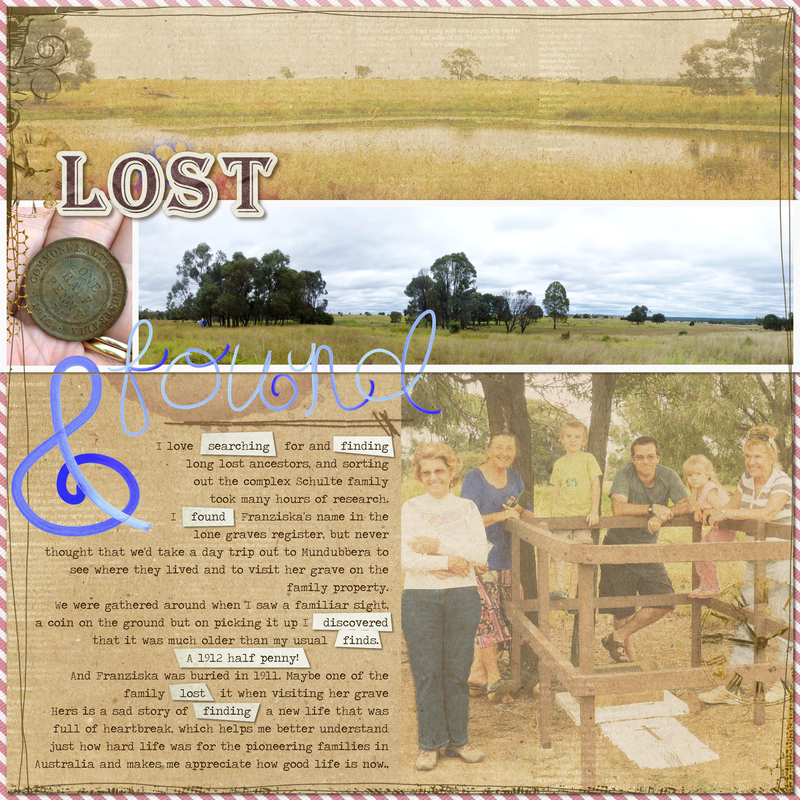 Hello my poor neglected blog & what a long 5mth break from the digidares too… this week’s dare “Lost & Found” was a redo of a LO barely started before my hard drive crashed and I lost it. Needless to say the 2nd attempt turned out much better than what I remember the first being. “Find a hap’penny and pick it up & all the day, you’ll have good luck”. Elements: Studio Romy- Preserving Memories, T Reed- Like you a latte, Thaliris Designs- A Present.Alphas: Studio 68- Memory Keepers, B Bonneville- Just painted. 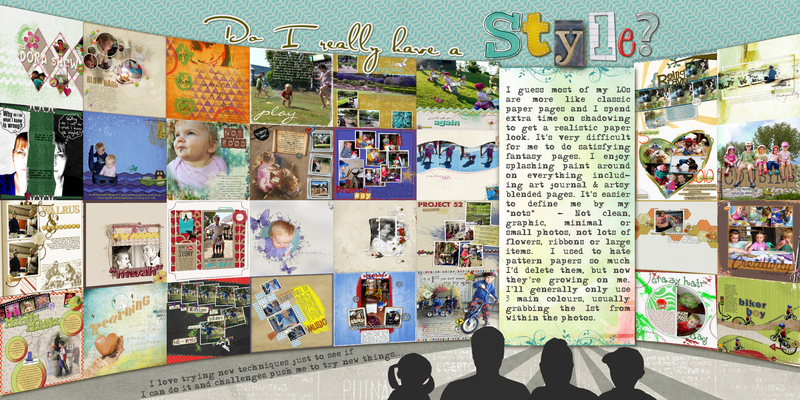 This week’s digidare is about scrapping about your preferred scrapping style (try saying that 5 times fast!) I’ve been wanting to scraplift Jana Morton’s “Blueprints: The angles of photoshop” example page since seeing it for the first time & going “wow! I think I can do that – what a great idea”. This dare just lent itself to showcasing heaps of LOs. Papers – JM Designs Daydream collab, Oscraps 7th birthday collab. Alphas – K Fredricks Mumbo jumbo, BZB Designs Chic stitch, P Kesselring Printer block, K Aagard Grade School & Fruity Cutie, K Winiecki Click to Scrap. Fonts – Satisfaction & adler. Had to attempt this week’s digidare again to scrap a LO inspired by the “what my friends think I do…” meme. Started out thinking I’d just go about it like the traditional ones with a gamer theme but it didn’t quite end up that way. 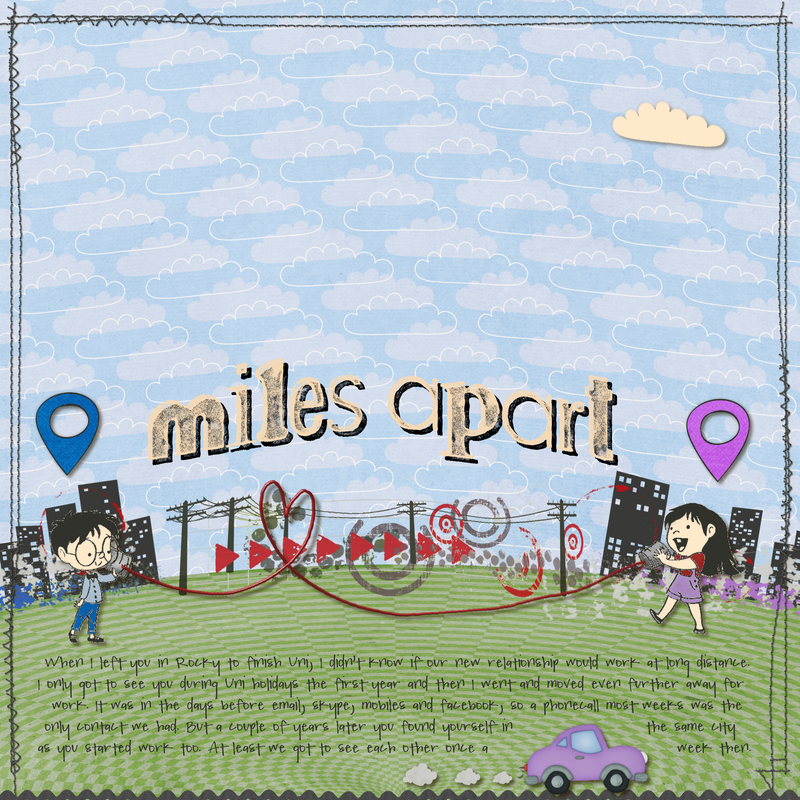 Credits: Kristen Aargard Technogeek kit & Meep Bop, Other Papers – Chelle’s Creations & Timounette, Frame – Anita Designs I Love to Craft, Elements – Bella Gypsy, Paula Kesselring, Ikeagoddess, Alpha – Jen Reed What a Man, Fonts – Remington Noiseless, Minecraftia. Scrapping a dream this week for the digidare. This one has been niggling at me for about 3 years now & I’ve even got the course about 1/3 done. 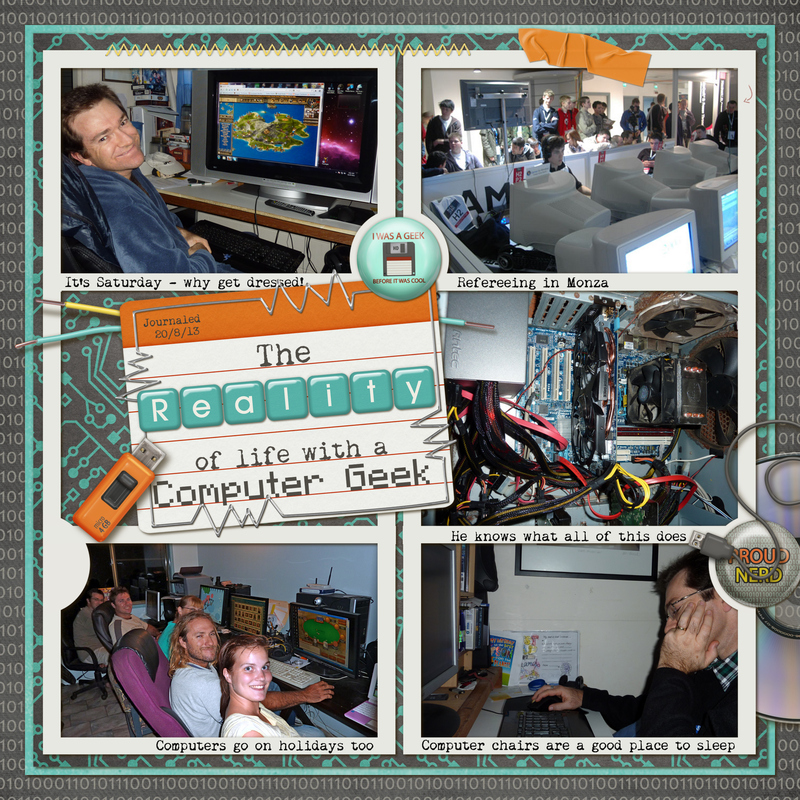 What is holding me back – is it going to be worth the cost of purchasing a laptop or 2 and would I find enough students willing to pay to redeem the cost of those. For now – dreaming on! 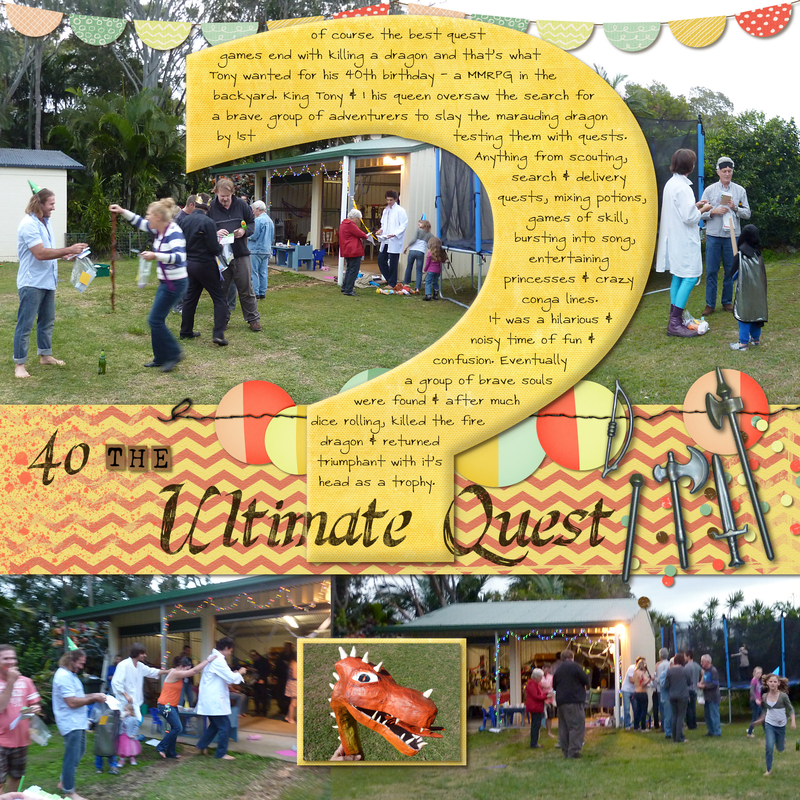 For those non-MMORPG fans, a big yellow question mark indicates a computer game character who has a quest for you to complete – the perfect addition to DH’s birthday ultimate quest LO. Alpha: Karah Fredricks – Life as we know it. Fonts: Meiryo UI Bold, Last King Quest, Pea Jack n Jane. 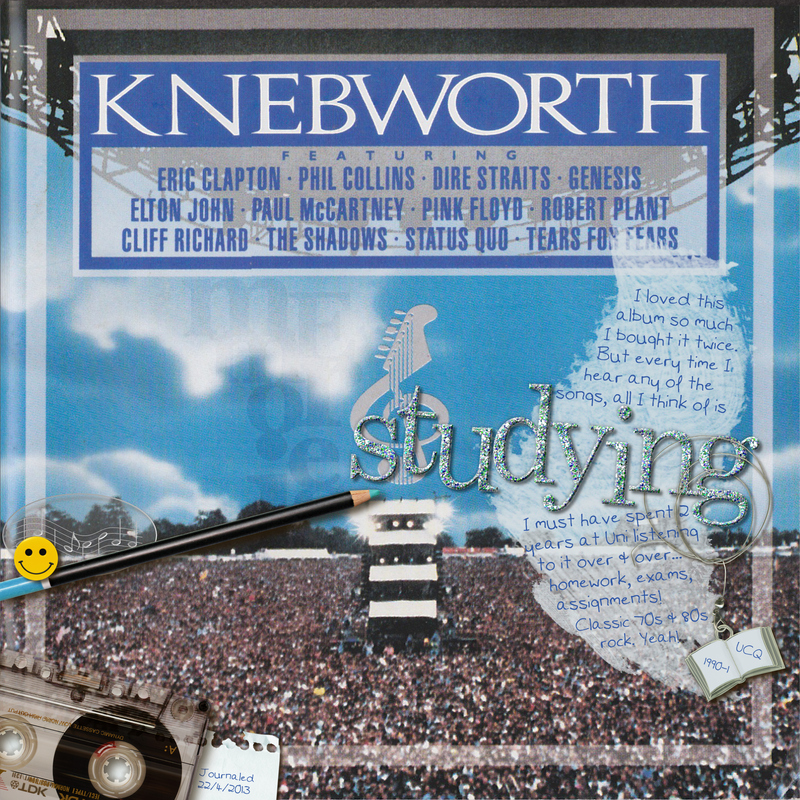 A music dare this week and it just had to be the good old Knebworth album from 1990 – 1st bought on cassette tape, containing classics like “Money for nothing” Dire Straits & “Hey Jude” Paul McCartney. 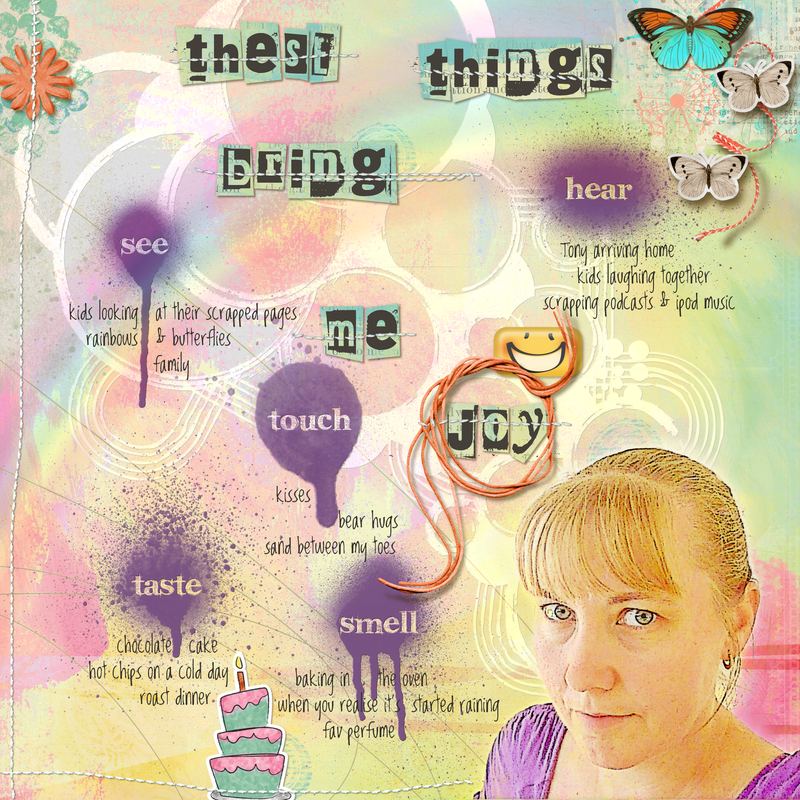 Credits: Paula Kesselring – My personal notes kit, Pink Poppy Press – Alpha, Chaos Lounge – charm, Studio 68 – wordart, Own handwriting – font. Oh how I would love to be able to teleport, so when I saw this week’s digidare on “what super power would you like?” I just had to join in. Save time, save fuel – as long as they can put me back together right at the other end it’d be awesome! This is the first time I’ve found a use for the wind distort on gimp to give the “beam me up” effect, tried this when the “erase every 2nd row” didn’t seem to work. Rotated the photo 90 deg, ran the wind distort & rotated it back. Credits: The Lilypad – Made for each other collab, Oscraps – Comfort collab, Obsidian Dawn – travel brushes, Alphas – Karah Fredricks & Ziggle Designs, Elements – Molivera Designs, Chili Designz, Dede Smith, Studio 68, Fonts – Toxica, Pea Bev.